Salt, Curry Leaves, Chilly, Cinamon, Clove, Cumin, Black Pepper, Citric Acid, Coriander, Oil, Fenugreek, Chana Dal, Asafoetida, & Turmeric. Cook 150 gm. Tuvar Dal and pieces of Onions, Pumkins, Drumsticks and Brinjal separately in cooker. Soak 20 gm. Tamarind in a cup of water and extract thick juice. 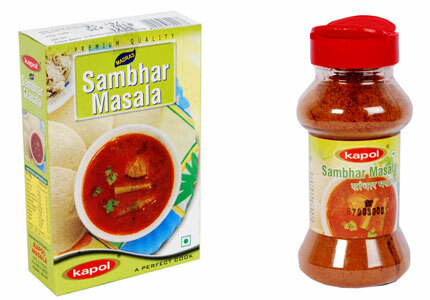 Mix Tuvar Dal , Tamarind juice and Boiled Vegetables with salt, chilly powder and 1Tblspn of KAPOL SAMBHAR MASALA and Boiled for 5 minutes. Add Mustard, Fenugreek seeds, Asafoetida and curry leaves into hard heated oil and mix the seasoned Baghar into the above mentioned Sambhar, Boil for 5 minutes.